It’s hard to imagine your livelihood being swept away in an instant, said Kelton Keller. Miles of cornfields scorched, utility poles with burn marks 8 feet up, and houses and barns burned to the ground. That’s what Keller, of Medina County, saw as he made the journey from Ohio to Colorado March 21-23. Earlier this month,wildfires swept through parts Texas, Oklahoma, Florida, Colorado and Kansas, burning hundreds of thousands of acres of land and killing thousands of cattle and horses. Mark Gardiner, a cattle farmer from Ashland, Kansas, lost his home, 550 cows, thousands of miles of fence, and 42,000 acres of pastureland. 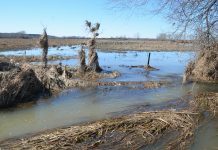 “We had our hay spread out over a 20-mile area to prevent a disaster like this,” said Gardiner. They had no idea the fire would take it all away. Gardiner farms 48,000 acres total with his two brothers, his sons and nephews. A large portion of his cattle grazing in a wheat pasture was spared from the flames. But through it all he is just happy to have his family safe. 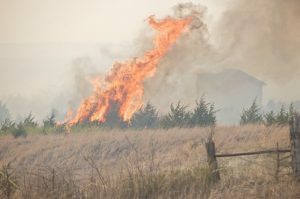 Amy France, with the Kansas Young Farmers and Rancher program, said while she was not directly affected by the fires, she is not far from those who were. “I just cannot really wrap my head around how that could affect me. Building a herd and getting it just how you want it” and losing it all in an instant, said France. She said one farmer shared a story with her of returning to the farm after the smoke had lifted and hearing the belbowing of calves lying beside their dead mothers. “It takes my breath away,” she said. “It’s very hard to comprehend. But as the dust settles, farmers from near and far have been reaching out to offer assistance, including a large group of farmers from Ohio. 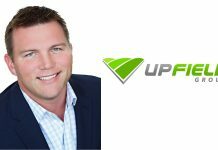 Keller, Cody Muhek, Steve Schafer and Jason Schriver, are just one group of many Ohioans reaching out. Once he saw the devastation being shared on Facebook, KEllen knew he wanted to do something to help. “It was keeping me up at night that farmers were losing everything — their cattle, their homes…” he said. 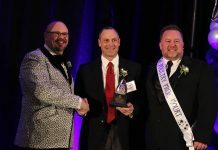 Keller felt moved to make a difference himself. 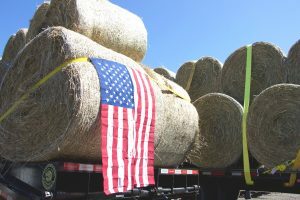 “I asked my dad, ‘what do you think about donating some hay?’ And he was immediately on board,” said Keller. He started asking his friends if they would like to help out and put a post on Facebook to see if he could spark some interest. 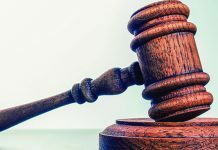 Before he knew it, he had two trucks and trailers loaded with 48 square bales of hay, 800 pounds of horse and cattle feed, and truck seats full to the ceiling of tack supplies, clothing, food, bottles of water and more. Community members offered to help with fuel costs and donated around $1,000 for Keller to take to the Colorado. “People were doing whatever they could to get money to me before I left; people that I didn’t even know,” he said. Keller chose to travel to Colorado because it was the state he had heard the least about. 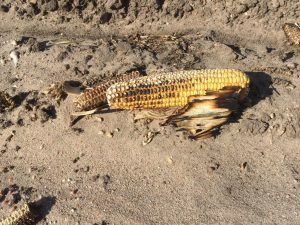 He got in touch with someone from the Colorado Farm Bureau who directed him to a farmer in need. The farmer told Keller he went to bed one night and woke up without any hay to feed his cattle. “He was fortunate not to lowe any cows, or his home, but he lost over 200 large square bales,” said Keller. The farmer also told Keller four houses had burned down in his area including his cousin’s home. “It’s really eye-opening, and really humbling” to have so many people come together to help, said Keller. 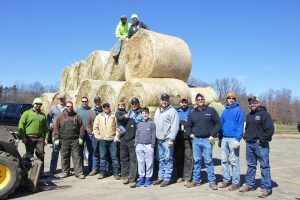 Friday morning, March 24, a convoy of more than 50 trucks and trailers, and over 50 people from all over Ohio will set out for Ashland, Kansas, bringing hay, fencing supplies, feed and much more. The large fleet started out as a few friends from Huron County, tossing around the idea to make the trip themselves. “I really didn’t see anything on the news about it, but I started to see some articles online” said Jason Nuhfer, a dairy farmer in Huron County. He sent a message out to a friend, asking if he would want to make a trip to Kansas to deliver some hay. One of those calls was made to Nuhfer’s brother-in-law, John Lengacher, of Wayne County, who admits he knew little about the fires when he got the call. His wife showed him some of the videos and images being shared on Facebook, and he decided to call some friends who had relatives living in the areas that were affected. They told him how bad it really was and shared some contacts with John, including Gardiner’s phone number. When John decided to give Gardiner a call, he said Gardiner sounded very tired, but also humbled. “He told me about the land that was burned and the miles of fencing that needed replaced and it really threw me back,” said John. John decided he was going to load up the truck and called up his cousin, Neal Lengacher, to see if he would be interested in coming along. Neal knew about the fires and had contemplated going out himself, and as soon as his cousin called him, he was all in. Between John and Neal, they were able to purchase around $4,000 in fencing materials, 23 bags of calf feed and minerals, and other items the people stressed they needed, all from donations they received around the community. “These people are very giving and we all feel very blessed and thankful to be able to do this for (the farmers of Kansas),” said John. Three semi loads will be leaving from Creston to meet up with Nuhfer’s crew and the rest of the Ohioans headed to Kansas Friday morning. “It’s crazy how many people have come together,” said Neal. 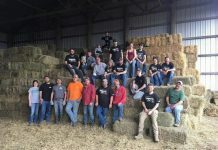 Especially through social media, which was how a group of farmers from the Portage County area joined in on the efforts. Daniel Duma had seen the post shared through a friend of his from the Huron County area, and gathered a convoy of over 20 trucks in a matter of days. Dozens of his fellow farmers came out to Duma Meats the day before the planned trip to Kansas, to help load the trucks. 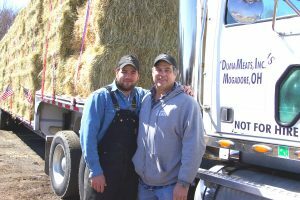 “This all started with my son Daniel,” said Dave Duma, owner of Duma Meats, looking out over the scene of local farmers coming together to load trucks and supplies. 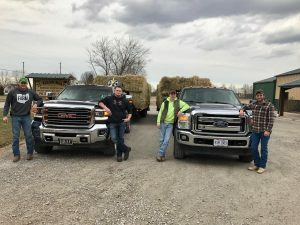 Two weeks ago, Daniel and a friend were going to haul two loads of hay out, but after putting a post on Facebook, they’ve attracted around 30 trucks, said Dave. 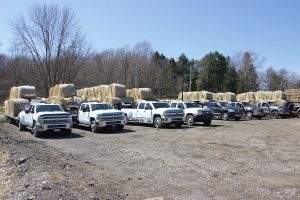 Daniel said when he reached out on Facebook, he had hoped to get at least three or four trucks to help haul hay down. He had no idea it would take off as much as it did. Community members have come forward to donate hay, milk replacer and feed for the animals, household items, and local businesses and community members donated money toward fuel. Rose Hartschuh, who runs a dairy operation with her husband, Greg, in Crawford County, has been one of the key coordinators in the Ohio-Kansas relief efforts. She and her husband had been discussing how they could help out when they got in touch with Nuhfer and decided to gather a group of their own to join the ranks. “I think several of us were kind of doing this at the same time and came together to make it one big effort,” she said. 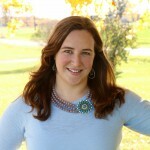 She launched Ohio’s Kansas Ranchers Wildfire Relief Efforts blog and Facebook page to share the group’s story as they travel to Kansas. 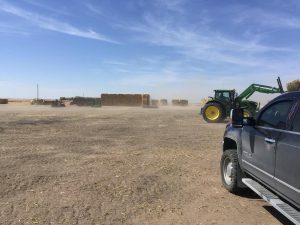 Upon arriving in Kansas, Hartschuh has put together a group of 25 individuals who will stay for a few days and help area farmers with fence repairs and other farm work in the area. Sara Tallmadge, who works at the OARDC in Wooster, and Candace Lease, a territory sales and reproductive manager for ST Genetics in Wayne County, are both volunteering. Tallmadge, like many others, saw a posting for the group of volunteers on Facebook and immediately felt she needed to be a part of the group. “I had been following (the wildfire coverage) through other agricultural platforms and I felt that Rose’s group was something that I needed to be a part of,” she said. Tallmadge also agreed that money just didn’t seem like enough. She has been running a non-perishable food drive at Ohio State ATI and OARDC to bring with her on the trip. “I think it’s just one of those things, we know how farm communities band together and I am excited to be a part of it,” said Lease. Hartschuh connected with France — through Facebook — to secure a place to stay once the group arrived. France said she contacted her youth pastor, 30 minutes from the Clark County area where the group will be working, and by the following Sunday, four churches in the community had offered to help and found housing for all those coming. 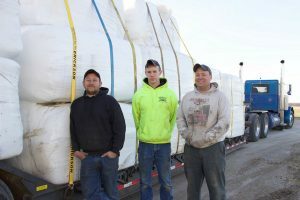 Along with an estimated $50,000 of hay, feed and fencing supplies, Hartschuh also received alfalfa and cover crop seed. Hartschuh also set up a donation site where the money raised will go towards fuel and trucking expenses with any extra going directly to the ranchers who need it. “When God has a need, what he does is raise up people who are generous to fulfill the need and that’s what he did here. The good Lord put the word out and everybody stepped forward and said what can I do. It’s just amazing,” said Dave Duma. There are several places to offer donations towards the farmers affected by the wildfire. Hartschuh said they will continue to collect monetary donations at Ohio’s Kansas Ranchers Wildfire Relief Efforts site, but will no longer accept donations of hay and supplies. If you would still like to donate supplies, click here for a flyer on how to donate to Kansas farmers. The National Cattlemen’s Beef Association has a list of relief resources including: The Kansas Livestock Association, call 785-273-5115 for more information; the Colorado Farm Bureau, call 970-520-3565; the Oklahoma Cattlemen’s Association, call 405-235-4391; and many more. We need to remember that we are a nation of people like these. We need to remember that it is OK to set such an example. What a great tribute to those that need the most help in troubled times. God be with all that donated and those that received in need. We will never forget the times growing up especially on the farm where help was there before it was asked for. Thank you Ohio Farmers, proud to have lived there for 50 years on our farm. People can still help. Call the Loudenville Centerra Co-op (Town and Country) (419) 994-4158 and purchase some fence posts. A group of young farmers taking fencing supplies from the area later this week to help build fence. 6′ Steel T posts. The co-op is ready for your call. God continue to keep and bless OUR FARMERS & RANCHERS!